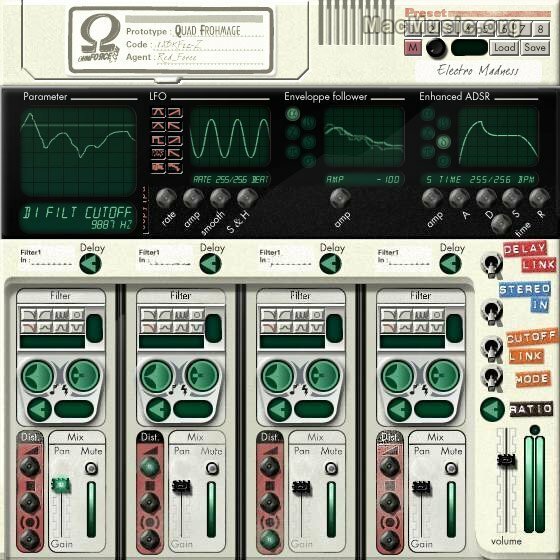 QuadFrohmage made by Ohmforce is a VST plugin for both Mac OS 9 and Mac OS X. It features four filters units, stereo processing, 30 filter modes, an advanced LFO module with 10 LFO types , an advanced XADSR module, 6 envelope followers, and 6 event generators. This new 1.2 version adds full stereo signal path and fixes two bugs : no more clicks when changing the filter type., and LFO phase control automation is fixed. More info from the MM Softwares section.